Maybe the most exciting part of our trip was a hike we took, looking for mushrooms, were we really hit the jackpot as you can see in the picture below. In addition, we picked blueberries and cloudberries, and we got a couple of nice trout, which will feature in some new recipes soon as well. Picking chanterelles are definitely the most fun though, and if you live in an area where they grow, you should definitely go looking. Spotting the scattered patches of yellow on the forest floor can be quite a kick, and often turns into a competition. If you prefer to stay inside through the fall, you can usually pick them up at most decent grocery stores at this time of year. Expect to pay a fair bit for good quality ones though. 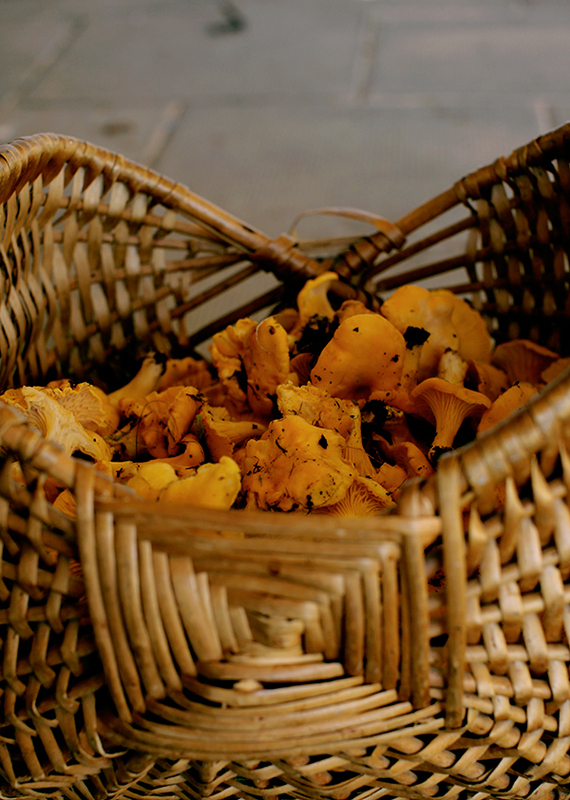 Chanterelles pair beautifully with trout and with all sorts of game, but we just wanted to make something really simple, where the chanterelles stand out as the hero of the dish. 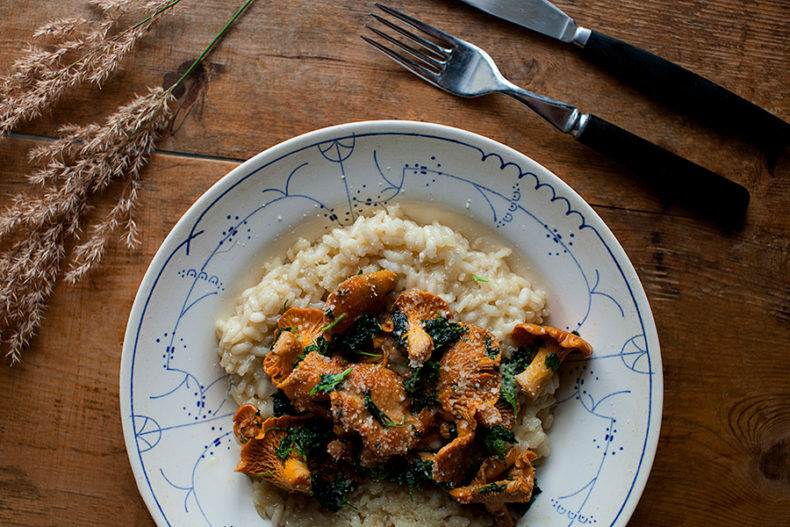 No meat is really needed as the chanterelles will add plenty of texture to the dish. The dish works great as a main for dinner or you can make smaller portions to make an autumn starter dish that is sure to impress. 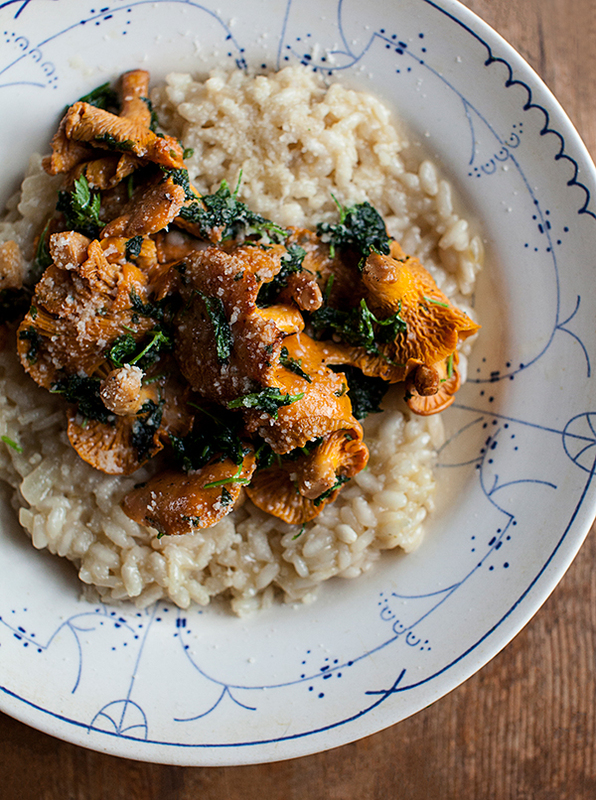 Mushroom risottos are often made with the mushrooms added at the beginning of the cook, but with as nice chanterelles as these, you want to keep it as simple as possible. So I chose to just lightly fry them up on the site with some fresh herbs, and add them on top at the end instead. Parmesan is most peoples first choice when it comes to risotto toppings, but if you want some more kick to your risotto, swap it out for a nice Pecorino. The cheese that you add to the risotto while cooking doesn’t have to be fancy, as you won’t really taste much of a difference. But try to add some Pecorino di Talamello on top, which is a type of Pecorino that has matured in the rock caves of Talmello to achieve a strong earthy flavor. Step 1 In a large pan, heat up a few spoonfuls of olive oil and add the onion. 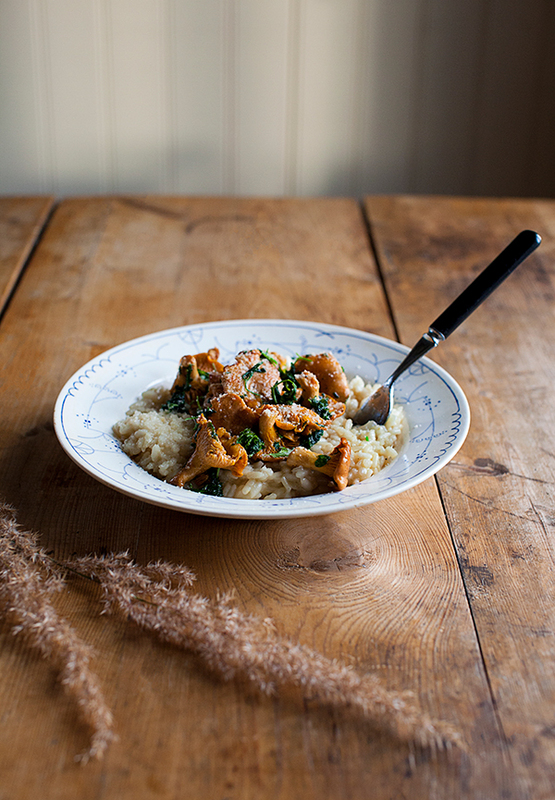 Fry the onion for 5-10 minutes on a low/medium heat, then turn up the heat and add the arborio rice. Add the white wine and about 1-2dl of the stock. Stir until the liquid is absorbed into the rice. Turn the heat down to a simmer, and keep adding about 1dl of stock. Wait until the stock is absorbed before adding another. Leave at a simmer for about 15-20 minutes. Step 2 When the rice is soft and creamy but has a slight bite, it is done. Add butter and parmesan, season, stir and leave to rest for a few minutes. Step 3 In a hot pan, add a bit of olive oil and the chanterelles. Cook until soft, then transfer to a bowl with the herbs, lemon juice and seasoning. Step 4 Serve with a drizzle of olive oil and some freshly grated parmesan or pecorino on top!